Sterling Breeze is a upscale resort on the west end of Panama City Beach. Facing west, our residence(Unit 1502) provides great beach and sunset views. 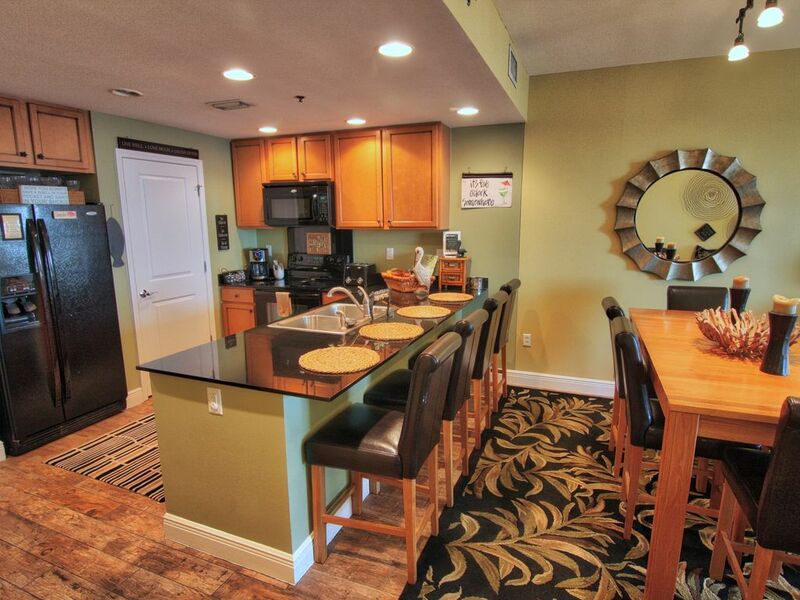 Our residence is beautifully decorated and features a 48in. flat panel TV in the living room and additional TVs in each bedroom(46in in Master). New wood-look tile floors throughout! TVs in every bedroom(including bunk area) and living room TV includes upgraded home theater system and SmartTV with complementary Netflix. Wireless Internet is provided at no charge in our unit and in the lobby. Great amenities include pool, pool bar (with great seating and multiple large tvs), shared hot tub, fire pit, and a state of the art fitness center. This year we are including the Beach Service as part of the rental fee. This includes 2 lounge chairs and an umbrella ready for you on the beach. The resort is convenient to the new Pier Park development(walking distance), which features great dining, entertainment, and shopping. You'll find over 20 restaurants like Jimmy Buffet's Margaritaville, The Back Porch, Reggae J's, Buffalo Wild Wings, Guglielmo's Italian Grill(and more) for your enjoyment. Shop at specialty stores like Simmering Sands and Paradise Found.....or favorites like Sunglass Hut, Borders, Dillard's, Old Navy, Hollister Co. and Ron Jon Surf Shop. For more information, visit us at the web address listed in the additional information section of this listing. Sterling has a great reputation for developing and managing resort properties. Sterling Breeze is an upscale development that's not so big that you feel crowded. It's easy to access and away from much of the local traffic during peak rental periods(and it's quieter). Pier Park is really convenient and is only a short walk. Most of our days 'at the beach' don't involve any driving since we have Pizza Hut and Dusty's Oyster Bar just across and a great selection of restaurants just down at Pier Park. Our unit is directly on the beach with westward views for fantastic sunsets. Unit rental includes access to external storage closet containing beach chairs, sand toys, boogie boards, blow up rafts, etc. Had a wonderful time in PCB. Had never been there before this trip. The sterling breeze building was very clean, All the workers were amazing. Friendly and helpful.. very nice pool and hot tub. Our stay, although short due to Hurricane Michael, was great while it lasted. This unit is nice, with an awesome view of the Gulf. Extra storage unit outside the unit for all our sand toys was a plus. Will stay here again! Beautiful condo! Décor is very beachy and very cozy - we loved it! Very clean and great view from the 15th floor! We have been coming to PCB for years and this has become our new favorite property. We liked everything about it and location is good. It's close to Pier Park and is still in a quiet area. Thanks to Olin and Karen - they were very responsive to every question and easy to work with! We will be back! This condo is absolutely wonderful. It is beautifully decorated and has an amazing view. The owners were very professional and eager to assist in all matters. The entire transaction was effortless! We had a wonderful long weekend and will definitely be renting again! Sterling Breeze 1502 is now at the top of our list! Thank you for sharing your beach getaway! It was the perfect location and setting to enjoy the beach! Look No Further - Stay at 1502! This was our first time to PCB and this room did not disappoint! It was so nice being able to drive in from a 10 hour car ride and walk straight into the condo with no problems. The room was beautifully decorated and super clean! The best part was being able to walk out on the front deck and enjoy morning coffee while watching the waves roll in. Only a few minutes from Pier Park. Pool and hot tub were very nice! Beach is just a few steps away. Would definitely re-book and tell a friend about this room! Hope to back next summer!